Today we will learn about electron beam welding, principle, working, equipment’s, application, advantages and disadvantages with its diagram. 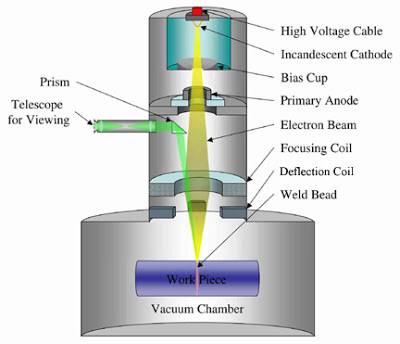 Electron beam welding is a liquid state welding process. Liquid state welding are those welding processes in which, the metal to metal joint form in liquid or molten state. This is also classified as a new welding process because it uses electrons kinetic energy to fuse two metal work pieces. This welding is developed by the German physicist Karl-Heinz in 1958. In this welding process, a high jet of electrons strikes at welding plates where its kinetic energy converts into heat energy. This heat energy is sufficient to melt the work pieces and fuse them into one piece. This whole process carried out in vacuum otherwise the electrons collides with air particles and loses its energy. This welding works on same principle of electron beam machining. This process uses kinetic energy of electrons to produce heat. This heat is further used to weld two welding plates. When a high jet of electrons strike at welding plates, its kinetic energy converts into heat energy. 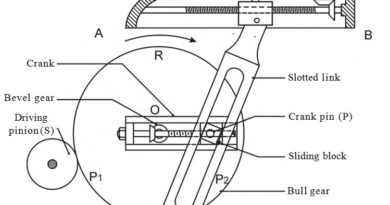 This heat energy is sufficient to fuse two metal plates together to form a weld joint. This process uses a power source to supply continuous beam of electrons for welding process. The voltage range of welding is about 5 – 30 kV for low voltage equipment’s or for thin welding and 70 – 150 kV for high voltage equipment’s or for thick welding. As we know, whole thisprocess takes place in a vacuum chamber. Vacuum is created by mechanical or electric driven pump. The pressure ranges in vacuum chamber is about 0.1 to 10 Pa.
Its working can be summarized as follow. First the electron gun, which is a cathode, produces electrons. These electrons move towards anode which is positive charged and placed right after electron gun. The anode accelerates the electrons and form a electron jet which is further move towards magnetic lenses. The magnetic lenses are a series of lenses which are used to absorb low energy electrons and does not allow to divergent electron to passes through it. It provides a high intense electron jet. Now this electron beam passes through electromagnetic lens and defecting coil which are used to focus and deflect the electron beam at the required spot. This unit direct high velocity electron beam to the weld cavity where its kinetic energy converts into heat energy due to collision. This heat energy is used to create weld by fusion. This whole welding process carried out in a vacuum chamber otherwise the electrons collides with air particle in the way and loses its energy. This working can be easily understandable by following video. It is used to join titanium and its alloy. This type of welding is widely used to join gears, transmission system, turbocharger etc. in automobile industries. It is used to weld electronic connectors in electronic industries. It provides high metal joining rate. Low operating cost because no filler material and flux are used. It provide high finish welding surface. It can used to weld hard materials. Less welding defects occur due to whole process carried out in vacuum. High capital or set up cost. Work pieces size is limited according to vacuum chamber. It cannot do at site due to vacuum. This is all about electron beam welding, principle, working, equipment’s, application, advantages and disadvantages. If you have any query regarding this article, ask by commenting. If you like this article, don’t forget to share it with your friends. Subscribe our website for more interesting articles. Thanks for reading it. It helps me college project to make my ppt Good.